Considering a trip to the majestic United Arab Emirates? Dubai is the jewel of the UAE, an ultra-modern city that combines new-age skyscrapers with ancient tradition. Only recently discovered by tourists, holidaymakers are now flocking to this city of extremes to visit the tallest buildings, the largest shopping malls and the most luxurious hotels on earth. 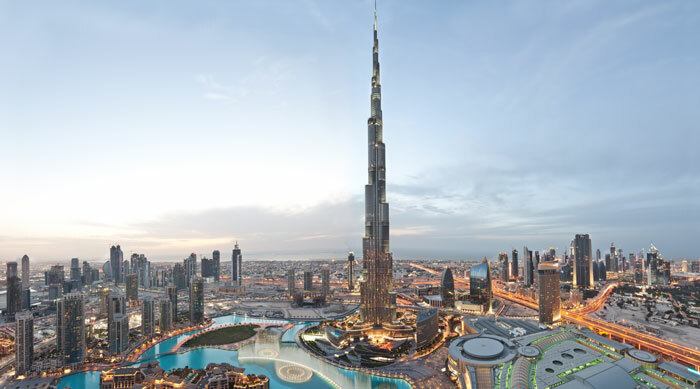 Take a peek at our top 10 reasons to holiday in Dubai! Don’t expect to return from a holiday in Dubai empty-handed; the city is packed with shopping opportunities ranging from high-end malls to street markets. The most impressive shopping centres are Dubai Mall, boasting over 1200 stores, an ice rink and an aquarium, and Mall of the Emirates which features a cinema and a ski slope. These complexes are so huge you could easily spend a whole day in them, but don’t forget to check out the ‘souqs’, traditional Middle Eastern markets where you can buy spices, jewellery and textiles. Bargain prices await those willing to haggle! The Burj Khalifa is the world’s tallest building, a wonder of modern architecture that is fast becoming a symbol of Dubai. The building is surrounded by a scenic park featuring fountains, gardens and tree-lined walkways, and two observation decks are open to the public on levels 124 and 148 which provide stunning panoramic views of the city. At 1,821ft the 148th floor deck is the highest in the world, and the records continue at the world’s highest restaurant on level 122. 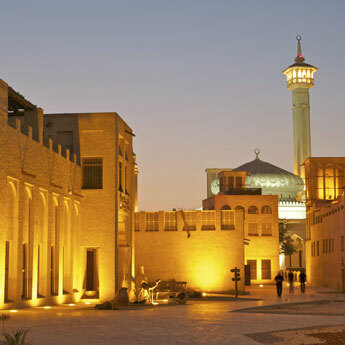 Discovering local history is an essential part of your Dubai holiday! 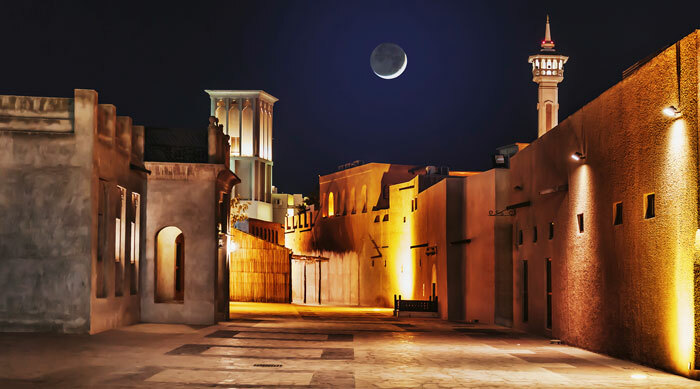 If you step away from the modern hotel complexes you will discover that Dubai’s past is alive and well in Bastakiya, the historical district where you can find traditional houses and preserved wind towers which funnelled wind into houses and acted as an early form of air-conditioning. Take a wander and soak up the atmosphere of a bygone age, finishing at Dubai Museum to get some context. 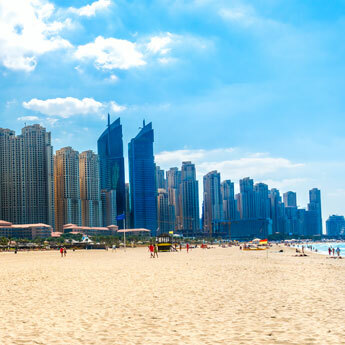 The hotels in Dubai have claimed most of the best sections of the city’s coastline, so the best tactic is to book your stay at a waterfront hotel for free access to one of Dubai’s premier beaches. However if you do find yourself without a sun spot on your doorstep, there are plenty of public beaches. The best are Al Mamzar and Jumeirah, and Kite Beach is a prime spot for kite surfing. Don’t let the all-inclusive restaurants distract you from the local options - Dubai’s street food is affordable and delicious! 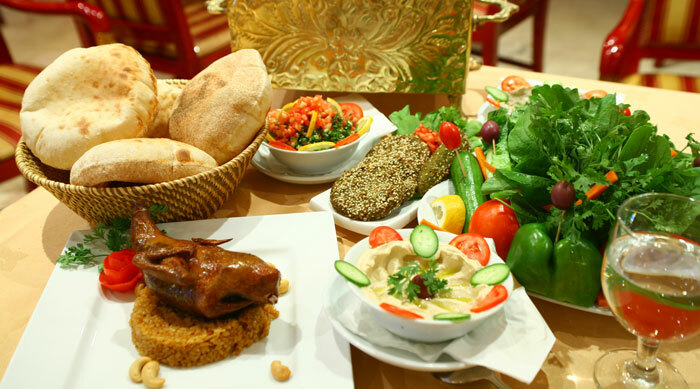 A holiday in Dubai is not complete without a wander down Al Dhiyafah Road, where authentic eateries serve up Indian, Lebanese and Iranian cuisine for rock-bottom prices. 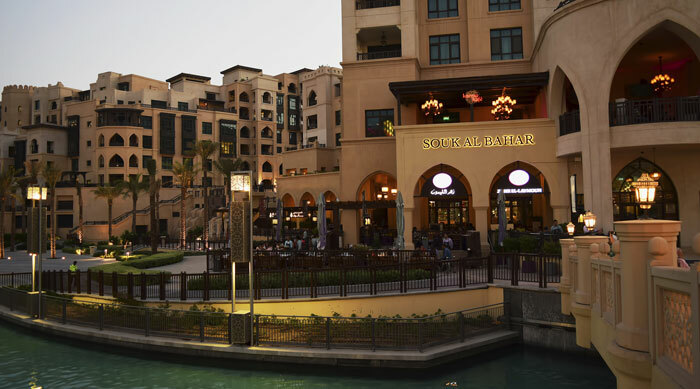 It’s also an opportunity to socialise with Dubai locals, who are very friendly and hospitable towards visitors. 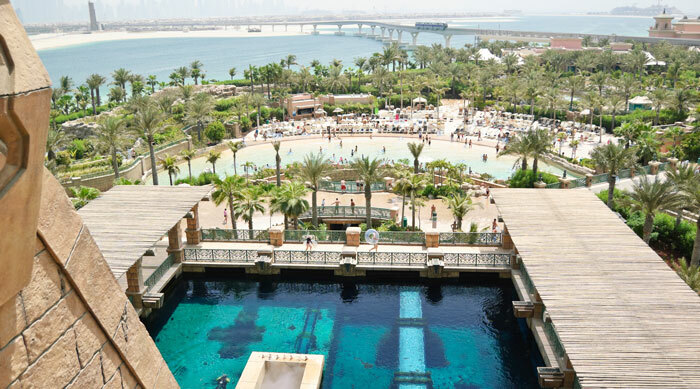 With its sizzling temperatures and high humidity, waterparks are a no-brainer in Dubai! 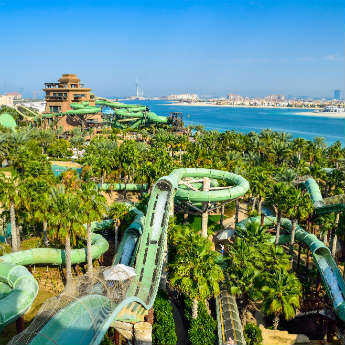 The most popular park is currently Aquaventure, part of the Atlantis Resort complex, featuring a ride named ‘Leap of Faith’ where riders plummet down a near-vertical chute into a clear tube running through a shark tank. However Wild Wadi is in close competition with its famous tandem slide Jumeirah Sceirah, where riders fall from a capsule down a 120m slide at 80km/hour. 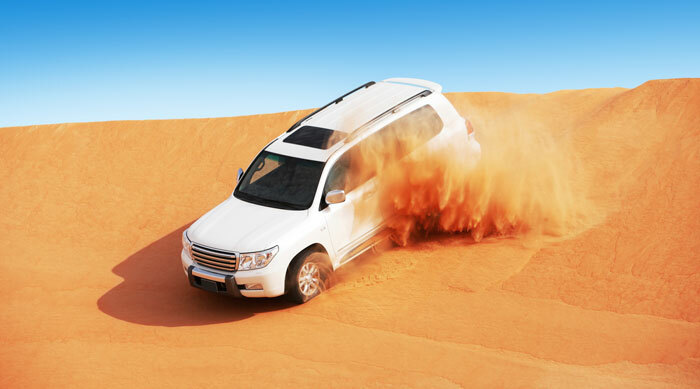 An essential experience on your Dubai holiday is visiting the Arabian Desert. Every possible way of experiencing this dramatic landscape is covered, from dune-surfing and camel-riding to 4WD tours and hot-air balloon rides, and most trips include evening meal and entertainment. Dubai has a huge variety of companies advertising all manner of desert activities, so you’ll have no problem finding something that appeals! In an act of absolute excess, Dubai has become home to a series of artificial islands built from sand dredged from the Persian Gulf. 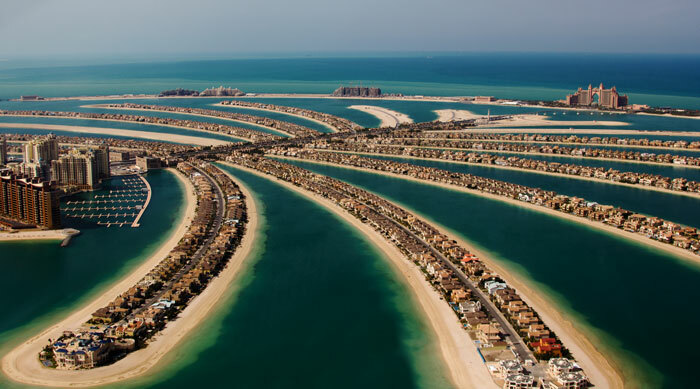 The Palm Islands are intricately designed affairs that look like palm trees from above, although currently only Palm Jumeirah is complete; Palm Jebel Ali has been on hold for several years. A recent design simply called ‘The World’ is a series of islands designed to look like a map of the world; when first built, investors rushed to buy themselves a ‘country’. The UAE is a predominantly Muslim nation, and Dubai has developed an ‘Open Doors, Open Minds’ programme that encourages people on holiday in Dubai to take the opportunity to learn about Islam. 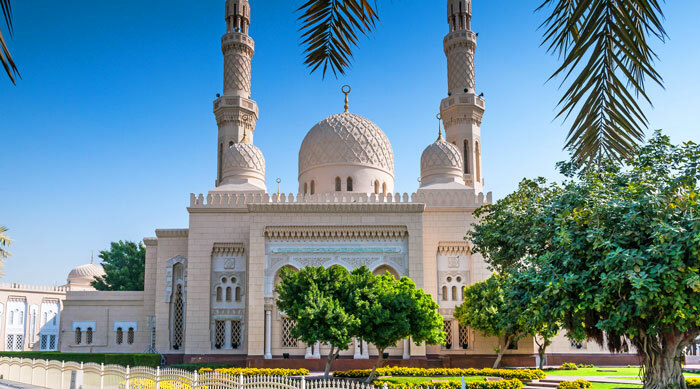 While most mosques only allow Muslims inside, the Jumeirah Mosque has opened its doors to non-Muslims who wish to see the mosque as part of a guided tour. Tours begin at the Sheikh Mohammed Centre for Cultural Understanding, and include explanations of the religion and prayer rituals and a Q&A session. Located near the Burj Khalifa, the Dubai Fountain is now the largest choreographed water display in the world. Designed by the geniuses behind the famous fountains at the Bellagio in Las Vegas, this performance of music and light features over 6600 lights and sends water shooting 150 metres into the air. We’ll take the claim that it is visible from space with a pinch of salt, but it’s undeniably an unmissable part of your Dubai holiday.